Modi vs Manmohan: Who is the better ‘medicine man’ of India's poor? Home India Governance Modi vs Manmohan: Who is the better ‘medicine man’ of India’s poor? Modi vs Manmohan: Who is the better ‘medicine man’ of India’s poor? The number of stores selling cheap, generic drugs to the poor has crossed 3,000, but the quality of medicines has declined and stock shortages are more frequent. New Delhi: Prime Minister Narendra Modi’s plan to deliver affordable medicines to the public through the rebranded and relaunched Pradhan Mantri Bharatiya Janaushadhi Pariyojana (PMBJP) is struggling to live up to its promise, with frequent product recalls and stock shortages hurting the availability of medicines and people’s faith in them. Launched by the UPA as the JanAushadhiYojana in November 2008, the scheme aims to ensure “availability of quality medicines at affordable prices to all” by selling cheaper generic medicines at more than 3,000 outlets across the country. Modi has often reiterated his government’s commitment to the programme since coming to power. “The sole aim behind this step is to ensure the availability of quality, affordable health service to the poorest of the poor, so that a healthy and prosperous India comes into being,” Modi had said in his first Mann Ki Baat address of 2018. Modi claimed that generic drugs sold in Jan Aushadhi stores conform to World Health Organization (WHO) standards. However, five medicines have been recalled from Jan Aushadhi stores in the last 20 days alone due to quality lapses. There were six other recalls between January and March, taking the total to 11 in just the first four months of 2018 while there were 11 recalls in all of 2017. Such frequent drug recalls are unusual in India, where a single recall can land a company in serious trouble, including legal action, an export ban, and financial losses. Drugs are typically recalled if the product is defective, contaminated, contains a foreign object, fails to meet specifications, or is misbranded. The agency implementing the scheme, the Bureau of Pharma PSUs of India (BPPI), recalled the products after they were declared ‘not of standard quality (NSQ)’ by state-level drug inspectors. Despite the increasing frequency of complaints, BPPI’s quality control department remains without a head. Also, three CEOs have resigned in three years, the last of whom, Biplab Chatterjee, has been running the show on an interim basis ever since he put in his papers in November 2017. The official line is that BPPI is looking for a new CEO and an “official announcement will be made soon”. Meanwhile, the ministry of chemicals and fertilisers, which heads the initiative, has launched an internal probe into 14 allegations, including charges of financial misappropriation, flouting of procurement rules and excess spending. The audit report made by the government’s auditor, the Office of the Chief Controller of Accounts, has alleged that some medicines are being sold at prices higher than the market price, defeating the purpose of the initiative. Although the problems plaguing the scheme are considered significant, it is still thought have recovered some of the sheen it had lost under UPA-2. Medicines: From 2014 to 2017, 636 medicines and 132 consumables were brought under the scheme, including drugs for cancer, cardiovascular diseases, and hypertension. This dwarfed the previous government’s achievement of making 100 drugs available from 2008 to 2014. Therapeutic categories: The scheme now covers all the 23 major therapeutic categories, including anti-infectives, anti-diabetics, gastro-intestinal, anti-cancer, and cardiovascular drugs, up from 10 categories covered earlier. Quality control: BPPI conducts quality tests on all medicines procured at laboratories empanelled with the National Accreditation Board for Testing and Calibration Laboratories (NABL). “This is done to ensure quality, safety and efficacy,” BPPI CEO Chatterjee told ThePrint. Suppliers: Until 2014, only government-owned drug-makers could manufacture and supply drugs for Jan Aushadhi. Now, more than 125 suppliers certified as following the WHO’s Good Manufacturing Practice (GMP) are part of the scheme. Earnings: Thanks to the rapid increase in the number of stores, the annual turnover of the programme rose to Rs 73.66 crore in 2017-18 (as on October 30, 2017), up from Rs 3 crore in 2008. UPA vs NDA: Who ran the scheme better? Experts blame the expansion frenzy for the problems being faced by the scheme. Under the UPA, the government opened 199 stores. A report by a standing committee of Parliament, issued in 2014-15 said only 99 of these were operational, the remaining having faced challenges in scaling up. It said the UPA was going “too slow” on expansion. 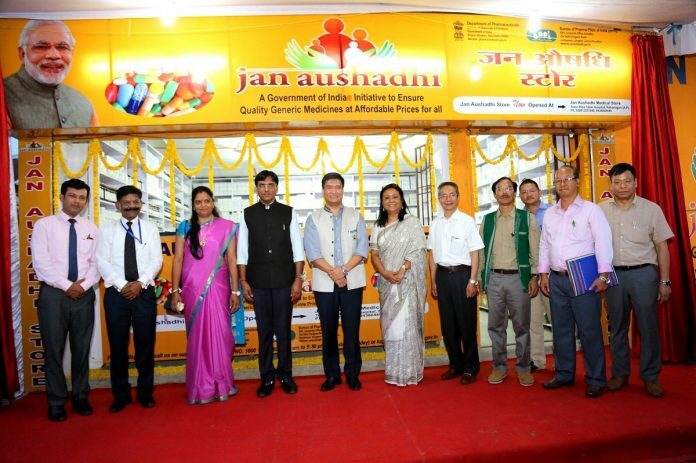 The number of Jan Aushadhi outlets has jumped manifold under the NDA government, crossing the target of 3,000 stores. However, critics say, the Modi government has gone too fast in expanding the number of outlets while failing to invest in quality control, back-end operations, supply chain management and human resources. Bejon Mishra, a consumer activist who runs a charitable hospital in Varanasi, opened a Jan Aushadhi store in 2016. “They don’t have as many formulations as they claim in promotions,” he said. While the government claims to have made 600 formulations available under the programme, Mishra says his store has never received a supply of more than 150 formulations. “Then, the frequent recalls pose bigger concerns,” he said, adding that he would close down his store if stock shortages were not addressed. To regain the confidence of retailers, BPPI’s CEO Chatterjee has issued a circular to assure them that the government is taking all possible steps to procure high-quality medicines.